This is a cross-post from the Nursing Clio blog originally posted here. At first, it was a simple case of “if you can’t beat ‘em, join ‘em,” as I worked with WikiEducation Foundation to teach a methods course in which students created disability history content. But the more I learned, the more it became clear that we were engaging in multiple forms of protest, especially once I began working on my own contribution. My past warnings to students not to rely on content created by the crowd were perhaps a vestige of anxieties that had led authorities to suppress Wikipedia’s precursor, L’Encyclopédie in the decades leading up to the French Revolution. Its impresario, the Enlightenment thinker Denis Diderot, had already been imprisoned for challenging established knowledge. Diderot would have been pleased by Wikipedia’s mission, “to bring about a world in which every single human being can freely share in the sum of all knowledge,” at the same time that he would recognize its flaws. Most editors are young white men who, consciously or unconsciously, ignore those on the margins. And Wikipedia’s “notability” requirement (“significant coverage in reliable sources that are independent of the subject”) inherently favors information from establishment sources. Such rules reinforce existing ideas about which topics merit coverage. My class faced real challenges. First there’s a daunting set of Wikipedia codes and hierarchies. And I was surprised to discover that even a generation weaned on social media fretted about public feedback from strangers. Then there was the focus on disability history. A field that began to coalesce around 2000, it seeks to expand thinking about a group that makes up nearly one fifth of the US population today. Unfortunately, a prevailing belief that disability is a static biological condition prevents most from understanding it as something shaped by society and culture much like race, gender, class, and sexual identity. At the beginning of my disability history courses, I tell students that they’re on the cutting edge of history, much like those a generation ago who learned about women’s history and the history of African Americans. I told this class that they were making history by writing it. Pointing out that history has a history, I invited them to consider how putting a group in context can combat prejudice and stigma. An entry that tells the story of your people on the world’s seventh most visited website can’t help but catapult you from being an individual struggling alone to being part of something far bigger. With belonging comes a sense of pride, a sense of having something to contribute. Learning along with my class, I wrote an article on the longest nonviolent occupation of a federal building in US history, the “Section 504 protest” in April 1977. Through an exhibit called “Patient No More: People with Disabilities Securing Civil Rights,” I’d helped bring this little-known disability Stonewall to life. 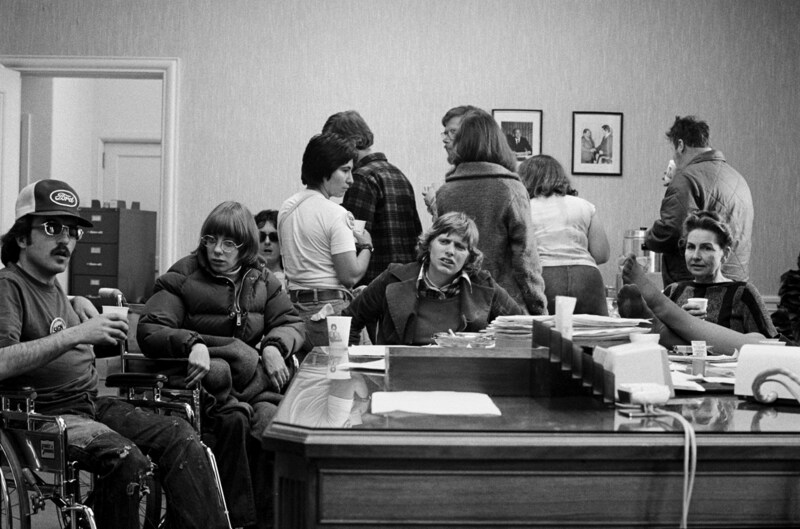 The successful month-long occupation by over one hundred disabled people and their allies would pave the way for the Americans with Disabilities Act (ADA). Four years before the protests, congressional staffers had slipped anti-discrimination language from the Civil Rights Act of 1964 into a vocational rehabilitation bill that was up for reauthorization. This countered views of “the disabled” as pitiful wards of charity. Rights included making public spaces accessible to people in wheelchairs and mainstream education open to qualified students with disabilities. This “Section 504” applied to nearly all public spaces, including government offices, universities, schools, hospitals, and transportation systems. Disability activists understood 504 as their bill of rights that still needed one signature from the Secretary of the Department of Health, Education, and Welfare (HEW) in order to be put into effect. Worried about costs, officials from the Nixon, Ford, and the newly-elected Carter administrations had stalled. After four years of trying every legal channel, activists snapped. 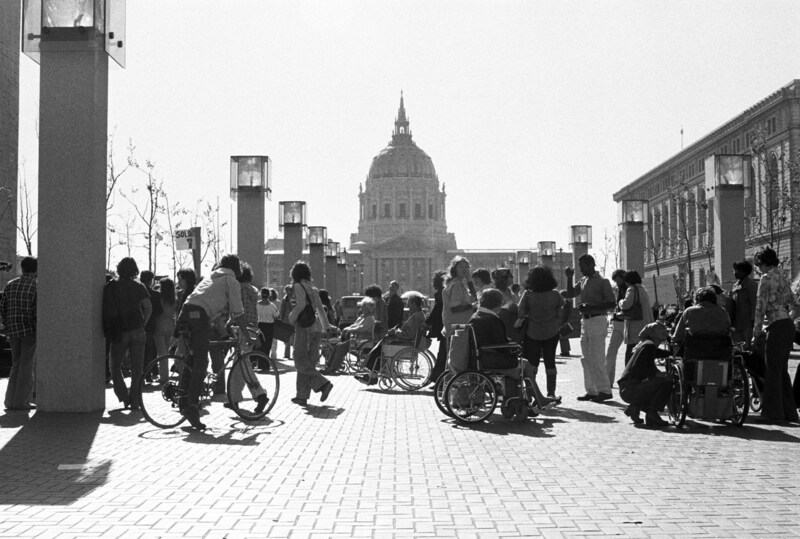 On April 5, 1977 people with disabilities took to the streets in cities with regional HEW offices. Almost everywhere protests were either cut off or fizzled. In San Francisco things were different. With little warning, over 100 people streamed into the Federal Building and refused to leave for nearly a month. The protests succeeded in part because of the Bay Area’s unique climate. Since the 1960s disabled people had been drawn to the rich mosaic of minorities who challenged the status quo: gay men and lesbians, students, artists, and practitioners of new religions, all that included people with disabilities. Decent weather made it easier to participate in antiwar protests, civil rights demonstrations, and the Free Speech Movement gathering momentum at UC Berkeley. In this electrifying environment disabled individuals came to think of themselves as people with rights, while putting them in touch with potential supporters. 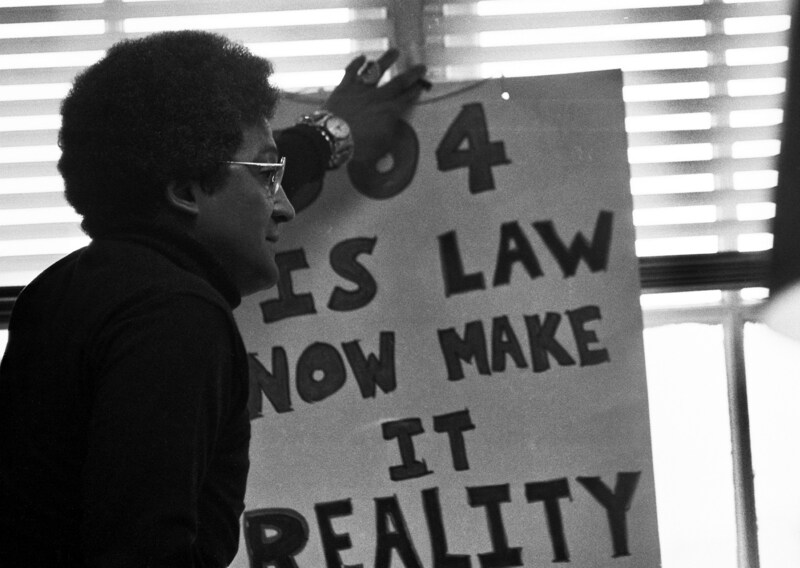 The 504 occupation also succeeded because savvy organizers, including Kitty Cone, Judy Heumann, and others, had spent years cultivating relationships and building coalitions. In addition to galvanizing disabled people themselves, they had educated politicians. Mayor George Moscone helped with portable showers while Congressmen Phil Burton and George Miller had the 4th floor of the federal building declared a temporary “satellite office of congress,” a theatrical stunt that allowed them to hold a public hearing about the protesters’ concerns to garner media attention. City officials allowed hundreds of people to gather each day on Civic Center Plaza below to cheer on the occupiers. The protest also enjoyed wide support from local community groups. In line with its popular food programs, the Black Panther Party brought in hot meals for all 100+ occupiers, including BPP members Brad Lomax and his attendant Chuck Jackson. And the disabled people inside risked their jobs and even their lives to be there. Amidst office furniture, people from different races, social classes, and with a variety of disabilities and their allies created a makeshift society. Some were seasoned protesters while others had never slept away from home before. Spending so many hours together forged cross-disability coalitions rooted in true interdependence — such as when someone who couldn’t speak could dial a phone so that someone without use of her hands could make a call. Just like in any community, there was bickering and intrigue and romance, but here there was also a sense of purpose and a political awakening. I teared up as I hit the “save changes” that would make this story public on Wikipedia for the first time, knowing a hard-fought victory was now part of electronic history and of course up for grabs. But how permanent is it? Even before the November 8 election ushered in an era ever more hostile to minority rights, I sensed something like 504 would now be hard to pull off. Everyone is on guard, literally and figuratively, in a national climate of building walls rather than alliances.